Looking to Protect Your Roof & Gutters From Costly Winter Ice? 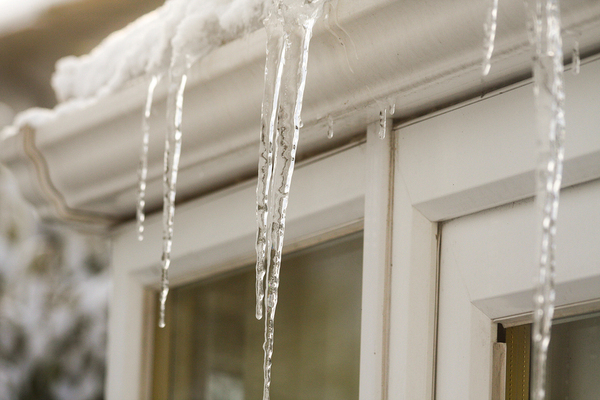 Ice can look pretty, but it could hiding a lot of damage to your home. Oh, dam: we’re talking about ice dams, those sneaky layers of ice that cause water to back up onto your roof. Ice dams occur when the warm roof of your home melts the snow and ice on your roof. That water slips into your gutters, where it freezes. Rotten roofs, mold, and water damage are all the result of those ice dams. How can you get rid of them for good? What’s behind the ice dam? It’s a lot of water. Consider a dam in a river: the dam blocks the water, and the water backs up, creating a lake. The same thing happens when ice forms in and around your gutters. That ice prevents water from your roof from flowing smoothly into the gutters. Instead, the water backs up onto your roof, seeping through cracks and into your gutters. If you have loose shingles, that water moves under the shingles as well, freezing, thawing, and causing trouble in your attic. The damage ice dams cause is often invisible at first. While you think that your roof is covered in a pretty layer of snow and a row of icicles hanging off the gutters, you’ll be dismayed when you notice the water dripping into your attic. What Other Damage Can Occur Due to Ice Dams? In addition to the damage that occurs when water backs up onto your roof, ice dams and icicles can also cause problems in your gutters. A gutter that’s full of ice isn’t working properly. It can’t drain, and the ice continues to build up. Ice is heavy and, over the days and weeks that it accumulates, it can expand in your gutters, causing them to warp. When spring comes, the gutters won’t drain properly. The heavy ice also causes gutters to sag and even tear off the brackets that hold them onto the house. When your gutters are clogged with ice and it rains, that water will spread over your walkways. When it freezes, you’ll have slippery walkways outside your home, posing a hazard to your family and for visitors. While ice looks beautiful, it’s a serious problem for your home. How Can You Stop Ice Dams? Thankfully, ice dams are easy to stop. You’re not going to stop heating your home and melting the snow and ice on your roof, so you need to keep that area warm so that it continues to flow into your gutters and down the drain. With a gutter heating system, you can warm the water that moves into your gutters, and prevent it from turning into ice. The heating system allows your gutters to do what they’re designed to do: move water away from your home. Helmet Heat® melts the snow and ice before it can form into damaging mounds of snow and ice weighing down on your roof and gutters. With Helmet Heat®, snow melts before it hits the edge of your roof, and flows down your rain gutters and downspouts. Damaging snow and ice buildup is averted. Download our Helmet Heat brochure and Helmet Heat Warranty to learn about Gutter Helmet®. Helmet Heat is the solution to ice dams. It’s simple to use because it doesn’t require any input from you at all. You don’t need to turn it on or off, and you don’t need to clean your gutters. Helmet Heat monitors gutter conditions so that it adds heat only when it’s needed to move the water through the gutter. Its simple, heated-cable system works with all roof types, including shingles, metal, and tile, and it works with Gutter Helmet or other gutter systems. If you are trying to navigate damaging winter weather, you need Helmet Heat as an ally. Let Helmet Heat help you manage winter without worry. *This product is listed to applicable UL Standards and requirements by UL.